Russia: ISIS Offensive on Palmyra Could Be Launched to Give Respite to Militants in Aleppo 4.3333333333333 out of 5 based on 9 ratings. 9 user reviews. According to Russian Foreign Minister Sergey Lavrov, a new offensive of the Islamic State (IS) terrorist group on Palmyra could be organized in order to deflect attention of the Syrian Army from Aleppo. A new offensive of the Islamic State (IS) terrorist group on the Syrian city of Palmyra from the Iraqi region of Mosul could be organized in order to deflect attention of the Syrian Armed Forces away from Aleppo and save militants, who stayed in the city, Russian Foreign Minister Sergey Lavrov said during a press conference in Belgrade, Serbia. The fact that the offensive of the IS terrorists on Palmyra was launched from Iraq and “apparently from Mosul” and militants marched through the “territories patrolled by the aircraft of the US-led coalition makes one think that – and I really hope to be wrong here – that it was orchestrated and coordinated to give a respite to those thugs, who are entrenched in eastern Aleppo,” Lavrov said. The Russian Foreign Minister also noted that from the very beginning of the Syrian crisis, the US has been conducting a two-faced policy towards Syrian terrorist groups. He pointed out that while the US-led coalition is fighting against the IS, it is studiously avoiding a fight against another terrorist group – the Al-Qaeda-linked Al-Nusra Front, which is currently known as Jabhat Fateh al-Sham. “There is a significant number of reasons to believe that [Al-Nusra] is being spared as the most effective combat-capable force, which opposes the governmental [forces] of the ground in order to be used for overthrowing the legitimate Syrian government when the time comes,” Lavrov said. He also stressed that Moscow is still ready to guarantee that the Syrian government forces will not target the corridors, allowing militants to leave Aleppo city, and once again appealed to the US, asking to persuade the armed groups to leave the city. “Those who want to be the part of the reconciliation process should immediately join the ceasefire regime, as all the others would be regarded as legitimate targets,” Lavrov noted, referring to the groups of militants, fighting against the Syrian Arab Army on the territory of the country. “That [the humanitarian pause] would mean another respite for the militants,” the Russian Foreign Minister said, adding that “we have been through this before.” Lavrov also stressed that the situation in Aleppo should be resolved primarily on the basis of the care for civilians. He also criticized the EU for its ideology-driven policy toward Russia, as well as for the pressure, exerted on its members, associated and candidate countries. “We are aware of the written instructions issued by the EU that oblige every [EU] country as well as the Associated and Candidate Countries to make [specific] statements concerning Russia,” Lavrov said. As the Russian Foreign Minister noted, according to the EU instructions, “all these countries” must condemn the “occupation of eastern Ukraine” and “annexation of Crimea,” as well as define situations around the Crimean Peninsula and in Ukraine strictly in that way. A little late for that. And personally, I think the SAA and its allies should have wiped the Aleppo militants out, giving them very little to negotiate for. I guess it was the civilians who were the pawns in the militants’ pocket. Lavrov and his usual BS. All these lies while ISIS advanced 15-20km west of Palmyra threatening Tiyas airbase. Also, no surprise that Russia is having difficulties with this war, since its defence budget has been further reduced in 2016. “In relation to GDP, the share of spending on national defense will be 4.7% in 2016, 3.3% in 2017, 3% in 2018, 2.8% in 2019. Yes, that’s the way to move forward Russia, by unilateral disarmament. Good job Lavrov & Putin..
Actually it seems that Russia has had much less difficulties in this war than the US several trillion effort over the “war on terror”. After all, I think that if the USAF bombed jihadists with vans filled with cash they would had spended less and probably gained more. Also, I see many folks are pretty much entangled in the typically jewish way of just looking at the money, without guessing anything else that more is better. Mr Lavrov I would presume you have no right to say anything on the matter. Sergei Lavrov has signed the sanctions against Serbia and the Hague trial when he was an ambassador in 1990.Sergei Lavrov close his eyes in regime change in Libya ,Lavrov recognized the Kiev Junta which continues to genocide the RUSSIAN POPULATION in Donbass.Lavrov with the high treason Minsk truce stop the advance of Novorossiya army to liberate Mariupol .Lavrov every time when Syrian army and allies advance stop them with some suspicious ceasefire never the opposite.Lavrov come from Gorbatjov and Yeltsin generation who lost the cold war and has inferiority complex toward west.The problem with Lavrov is not that he is a Atlanticists the problem is that he is above Putin when is handle the foreign policy. (the only time that Putin refused tho listen him was when he was against the Crimea annexation).The only hope that Russia will be an independent country is that when τhis dinosaur goes for pension and a new generation of diplomats take the foreign ministerium.Maria Zacharova will be a good choice. To Industrial and shipping from Mariupol, ….just needed to be bought off,. And They** would break with Kiev and free Mariupol. Ukraine is perfectly positioned between Europe and Silk road. They had to find new Opium Poppy seed to rebuild the A Stan Opium industry. Solution…..Seed stock was from Turkey and near match for climate . NATO fly the rebuild enterprise in. Brad I hope you have read my post about Ukrainian and RU oligarchical structure. There is shadow government in RU which is made up of RU oligarchs. Thinking that Putin or Lavrov have been calling shots independently is fantasy to say the least. When it comes to Ukrainian and RU oligarchs and their dealings a border between two countries means next to nothing. Conflict in Novorosia has been controlled by mates from both sides. Your post 5 days ago ? >> The most of the commentators have no idea how RU ruling elite works. And yes Putin will do everything to remove the western sanctions which have been hurtful to them. There is only one aria where RU interests are in harmony with Syrian government’s and that’s destruction of terrorists in order to prevent another Chechnya or Dagestan war. RU is obviously using Syria as a polygon for testing their weapons and attracting more sales for their military industrial complex. Another interest is tied to the RU energy sector which goal is to prevent the Iranian gas from reaching EU market. That’s why RU signed an agreement with Turkey for transit of their gas pipeline through its territory. That’s why there is no interest in liberating eastern parts of Syrian territory on the part of Russia. Unfortunately the most of people are capable of scratching the surface only. So this comment will not attract much attention or positive response either. Found this via your Disqus posting archive. Recently listened to an interview with Stephen Cohen who pointed out that Putin had focused on internal state reforms /economy. … and it did not go well for him. Russia’s Historic legacy of not do as Moscow requests. …with schemes and scams to avoid compliance. Cohen Said that Russia land Buracracy /Oligarchs only do 30% what Moscow orders. There is an earlier post with the link to YouTube video from 11 days ago. intelligence community. That doesn’t have much to do with real warfare. between them hardly makes any difference. My proof battle for Mariupol. whole operation was suddenly halted and the brigade Vostok was disarmed. the day of the event. Hence they used RPG to make sure kill. that those who really fought were not the ultimate beneficiaries. Watch this clip and prove me wrong. What he is talking about has an universal application. The history since the Communist revolution…as noted by my picture post this thread in concert with your posts. While I myself do not buy into all the Khazarian spin cycle which surges thru the alternative community at present. There was* a collective of criminals which one could use the Khazar label. ..who did cause exceeding trouble to ancient Russia and other regional people’s. They got run off afterwards. ..to not be the great collective they were formerly. The criminal racket which existed since ancient Silk Roads. The Venetian Bankers backed Europa vs the Mongols…and even backed the Mongols. They exceeded their lease of extortion and spying and of course…creating coin and debt banking. And today now in Wallstreet. The Venetian bankers had historic roots via migration going back to Babylon. Like a crime family of removed cousins and uncles. ..
As you mentioned…the Ukraine Oligarchs and the Russian have a shared history together. So ya…..a deal to not tumble Mariupol gets struck and then certain leaders get struck. ….and the moving map settles out. The Chinese were locked out of certain technology and got creative to aquire that. ..so they could build their own Su 27 . Using defect problems and other periphery excuses…they tricked Sukhoi into sending techs to China to resolve the problems. They manipulated certain techs to give up the needed know how on production engineering and computer/flight/communications interface. Russia was livid after…Probably some of the Sukhoi techs went to prison. In the world of business the deceit is mere moments away. These regional conflicts are the deals struck by criminals and governments. With other nations and their criminals….angry and angst to get into the Fight Pit! Poster 888mladen on Southfront shared about RU Oligarchs and Russia’s interests. Divisions within Russian leadership on numerous agendas from Geostrategic, economy, to military. Numerous Web forums have posters appealing to Moscow via the posts to act on behalf of the Donbass….or Syria etc. Russia MOD via Moscow Times…if article is accurate, …Stated No Russian ground Forces will be sent to Syria…as media roiled over Palmyra. Since the Hama riots in the 60s. Idlib and other places are decades with anti Damascus groups and Anti Baath party. Required some background to justify the cutting comments. Where several assassination attempts on his life occured. Syria’s military can turn the corner…Russian training and realistic operations pace. I still however am ?? as to Russia’s future agenda in the mid east. While Russia has relationship with say Iran….things are not allways like they appear. Here is an interesting video clip if you would like to watch it. Thank you, Mr Lavrov. I am not a politician, diplomat or military expert but I am sure that you are doing the best given all the circumstances. There is more in the bigger picture. It is tough.I know. Best wishes! Thank you for the link. I stand by what I said. You sure know that the americans are not to be trusted, quite well armed and their military bases are all over. Loosing a battle does not mean loosing the war.Too much is at stake- Crimea, Donetsk, Lugansk.I don’t have to list all possible hot spots. I believe that whatever comes out from Lavrov is coordinated with Putin, Shoigu and team.Thanks God, we are not in a position to make important decisions regarding global matters.There are people, who are appointed and elected to do that( I am not talking about EU).We should leave it to them. Btw I am also mad about Palmyra but did not loose my marbles and will not practice the”blame game”. Maybe in some deal….US make sure Mercs now in Palmyra do not pull down any more Historic property. US take over Areas which Media and US Gov label as ISIS. The oil pigs will screw each other over for a buck like no other. We ponder who might control what pipeline route from where. Of loot Iraqi and Syrian oil..
Maybe even list on the world stock market in some shoddy label set up. Not saying this is going to happen….yet it could happen that US walks into Syria with the Mercs faint away and maintain a security zone over Palmyra and other central Syria. Top dog for future energy routes if they occur. US military stay on for decades……just ask Europe what it means to have NATO around. Eventually free to the most part the foreign mercs wars. Offshore from Gaza to offshore Sinai. Once Uncle Sam goes in…..you can’t get the @r to leave after. Again. …I hope I’m wrong….and Syria goes free from this nightmare. 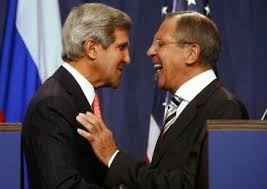 Lavrov caused this nonsense with his non interest Kerry NATO suggested cease fire.He risk the soldiers life’s and equipment.He must stay in consultation with the Syrian government who invited Russia.Not Erdogan or Kerry let Syrian government decides as affected country.No more guy love play with NATO Kerry or NATO Erdogan. 6) The “Salafist principality” will be established as described the the article. This Lavrov guys really risky and stupid.How can the army deflect its attention from the terrorist.Of cause their are going to arrest and use population again as shields.Before any retreat let terrorist surrender or die.Maybe it is USA special forces which have remained.